The Joma Top Flex Football Trainer is a classic in Indoor Soccer - this model is designed specifically for this sport, with circular double stiching reinforcing and adapting the upper for a perfect glove like fit. Very light-weight. 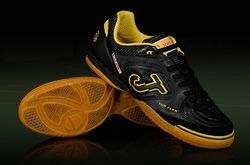 This superb purpose built Joma TopFlex indoor football shoe offers incredible comfort, flexibility and durability. The gum rubber soleplate generates solid traction and high flex to maximiase speed and agility on all surfaces. With the popularity of Evening Soccer and Five-a-Side Football these Joma TopFlex Indoor Football Trainers in this striking White colour are a must have for those of you joining this ever growing sport!